Al Hazm is one of the less known castles in Oman, but I still think it’s definitely worth a visit. The inside of the fort has lots of interesting rooms, with secret chambers, prisons, and date store rooms; some of the rooms even have cannons, old rifles, daggers, and other 18th century artifacts on display. Al Hazm is one of the few forts in Oman that has an audio guide, and even though I didn’t use this I’ve heard it’s super informative and done in clear English. It’s also completely free! 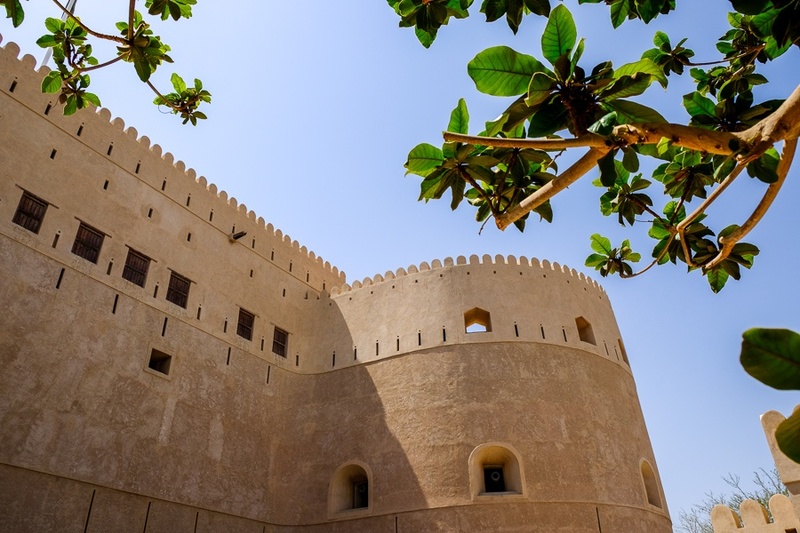 There are designated places in the fort where you can use it to get some extra insight into 18th century Omani life and how the fort was used over the years. When I visited Al Hazm I had already seen a bunch of other forts on the same day, so I was starting to develop some major ‘fort fatigue’, but I’m still glad I walked up to the top of the fort to look around. You can walk along the inside of some walls at the top, and the views are pretty nice. Al Hazm is located near Rustaq, so it’s pretty easy to visit if you’re planning to go see Rustaq Fort or Nakhal Fort! I’d say it’s very worthwhile! The castle is in Rustaq, about 70 miles (110 km) from Muscat. You can drive there yourself with a rental car, or there are prepackaged day tours to Rustaq from Muscat that include the castle as part of their itinerary. There’s an entry fee of 0.5 Omani Rials ($1.30 USD), but this only applies if you come here without a tour. Bring water! The walk up to the top of the fort can be extremely hot depending on the season.